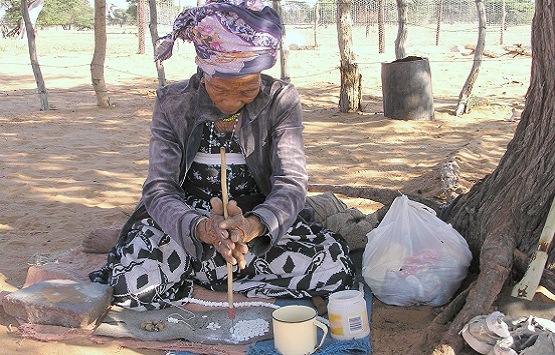 Taa (also known under the name !Xóõ or !Xuun) has about 500 speakers in Namibia and about 4000 speakers in Botswana (source: DoBeS Taa project). Not all of these speakers are really fluent in the language, and more pessimistic estimates give the total number of speakers as 2000 or 2500 (see http://www.endangeredlanguages.com/lang/593). Taa belongs to the Tuu (or Southern Khoisan) group of languages, which traditionally are grouped together with other languages as Khoisan languages. The examples in this package show the West !Xoon dialect spoken in Namibia. Among linguists Taa is famous because of its enormous inventory of phonemes: it distinguishes more than 80 consonants (the exact number differs according to different theories and interpretations), including clicks, and 20 vowels. It also uses two tones (high and low). Read more about the sounds of language in the Book of Knowledge (Chapter 4). How does Taa sound like? Click here to listen to the following sentences (audio file Taa-Illust1.mp3). I speak the ǃXoon language. n si tana ka ǃXuun ǂaan. The sky is blue. nǃárí-sà’án gǂhúì-gǂhùí. The sun is shining. ǁ”ang si nǃain. The moon is full. siǃqhann a ǃoqm. The rain is falling. ǃqx’oe si ǃaa. Find more examples and exercises on the Interactive Map! DoBeS Taa project. This site contains short information on the language as well as on geography and culture. The Taa corpus in the DoBeS archive offers more information and resources, some accessible for unregistered users.